New study uncovers why fatty foods make you less sad. A bowl of ice cream. A giant serving of mac 'n' cheese. A plate of chocolate chip cookies. We already know that fatty, comfort foods can help bust a bad mood -- but new research from Belgian researchers gives new insight into why. 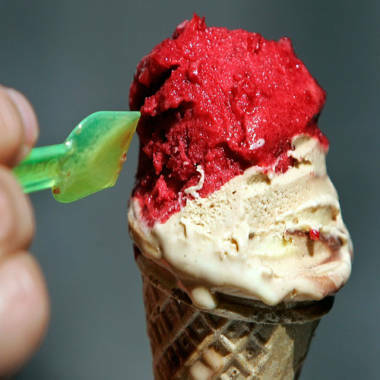 Turns out, there may be more at play here than the visual, psychological effects of seeing the ice cream (or the pasta, or the cookies, or -- insert your go-to comfort food here). The study, led by Dr. Lukas Van Oudenhove of the University of Leuven and just published in the Journal of Clinical Investigation, suggests that it's the fatty acid itself in those foods that works to decrease sad emotions. Researchers recruited 12 healthy, non-obese volunteers, who were studied the morning after a 12-hour fast. Each individual underwent four 40-minute fMRI scans (that's functional magnetic resonance imaging -- or scans that measure brain activity). Here's where it gets kind of lab-rat-like: The participants were hooked up to a gastric feeding tube that administered 250 milliliters of either fatty acid or a saline solution. But three minutes before they were given the intragastric infusion, researchers played the volunteers 11 pieces of sad classical music, of 1-minute duration each. At the same time, 10 sad faces were projected onto a screen in front of the volunteers. Without knowing they'd just been gotten a hit of fatty acid, right to the gut, those volunteers reported feeling 50 percent less sad than the ones who got the salt solution. The researchers also found that the infusion of the fat solution to the stomach lessened the behavioral and nerve cell responses to sad emotions. As Van Oudenhove explains, the novelty of this study is that the researchers believe it was the first to determine that fatty acid itself works to brighten a bad mood -- even without the visual cues that come from seeing a cheeseburger or a cupcake. OK, but it's still a lot more fun to indulge in your favorite foods when you're sad. What's your favorite comfort food? Leave a comment telling us what it is and whether it cheers you up. Follow msnbc.com health writer on Twitter: @melissadahl.